It is important to eat breakfast. The woman is drinking a cup of coffee. 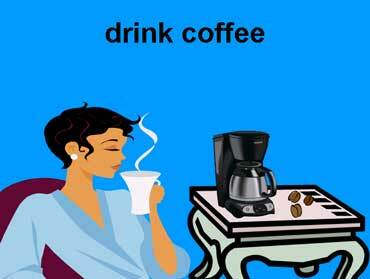 Many people drink coffee in the morning. 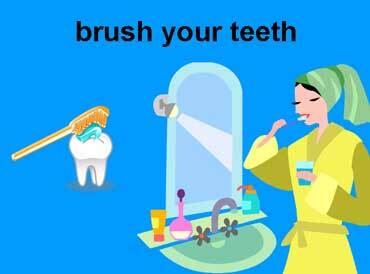 After people eat breakfast, they brush their teeth. They use a toothbrush and toothpaste to brush their teeth. Copyrights to the pictures and photos on this ESL and EL Civics website belong to individual photographers. We have purchased the rights to use them. Do not copy the pictures and photos on this site. Permission is granted to copy any of the worksheets for classroom use. Permission is granted to link to any page of this website. Contact Christina Niven at christina@elcivics.com. Please send corrections, comments, greetings, and requests for new photo tours, lessons, and civics units. Copyright © Christina Niven, 2007.